* Field Notes starts with a juicy orange blossom and sweet patchouli. * Although this is listed as a feminine, I definitely can see guys wearing it. It reminds me of the better Chanel masculine fragrances – like a sweet cologne. * The orange blossom stays present throughout the fragrance. It starts to get a little soapy when the sweet patchouli is joined by tobacco and leather. * Once it gets past this phase, Field Notes is different every time I wear it. Sometimes I get wood and amber with orange blossom in the base. Other times I get more tobacco with a touch of tonka. 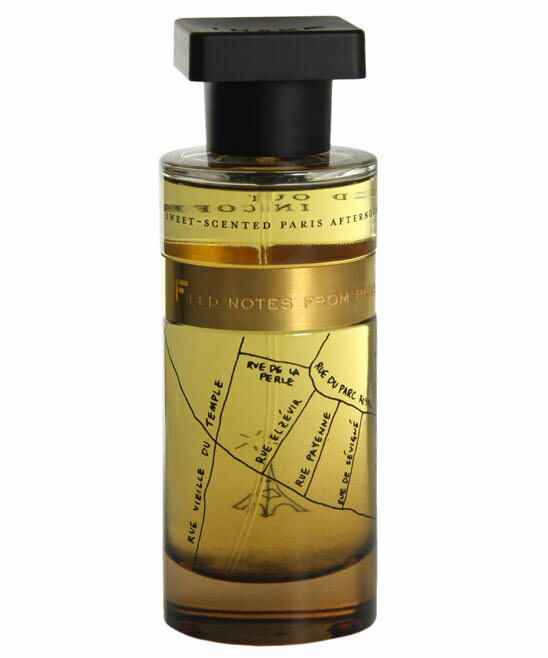 Summary: Field Notes From Paris is an orange blossom fragrance that is full-bodied but not overpowering. This would be a great office scent as it feels like a classic masculine with a modern twist. It lasts through the work day and the base notes will go on into the evening. This would make a great gift for college graduation (or even father’s day). It’s very wearable and a bit unique – just like the person you would probably be buying it for. Ineke Field Notes From Paris is available from www.Ineke.com and from select boutiques. Field Notes From Paris is my favorite perfume from the line. I agree with your description of it but wanted to add that those base notes will not only gowell into the evening but might also survive a cold water wash in your washing machine (haven’t tested with a dry cleaning though). Wow.. I didn’t realize the longevity was so strong. Ineke was such a sweet person when I met her at Elements. Which of her fragrances from the sample pack do you recommend that I test next? Sorry it took me so long to come back and reply: usually I do it within a week. My second favorite in the original line is E. But all other letters are not bad, in my opinion, for that price range. I can’t do G though – it doesn’t play nice on my skin.